Villanova Wildcats guard Mikal Bridges. The 2018 NBA Draft is right around the corner, and while the Philadelphia 76ers may not be any closer to naming a full-time replacement for general manager and president of basketball operations Bryan Colangelo, who resigned early this month amid a scandal involving his wife, anonymous Twitter accounts, and the sharing of privileged team information, the team is preparing to make yet another lottery pick, one of their six five total picks, on Thursday night. After selecting first overall in each of the last two drafts, the Sixers will have to wait until the 10th overall pick this time around. But with two first round picks and four three in the second — h/t Sam Hinkie — it's going to be a busy night for Philly's still-fluid front office, which now has head coach Brett Brown running the show, albeit on an interim basis. 2018 NBA Draft: Should Sixers consider trading up for Euro phenom Luka Doncic? The Jump: NBA Draft Special will document the NBA Draft on ESPN2 with a diverse array of voices, led by Rachel Nichols – host of ESPN’s daily NBA studio show, The Jump. Nichols will join a cast of ESPN NBA commentators, including Brian Windhorst, Amin Elhassan, Zach Lowe, Dave McMenamin, Tim Legler, Fran Fraschilla, Chris Haynes and more to react to the news and information coming out of the NBA Draft. ESPN2’s The Jump: NBA Draft Special will originate from ESPN’s South Street Seaport Studios in New York. Both the ESPN and the ESPN2 telecasts are available to stream via the ESPN App. Finally, for those not interested in actually watching the draft, you'll be able to listen to it live on ESPN Radio and the ESPN app. WHEN DO THE SIXERS PICK? MORE: Should Sixers consider trading up for Euro phenom Luka Doncic? In the weeks leading up to the 2018 NBA Draft, our own Kyle Neubeck has been breaking down some of the top options for the Sixers. Here's a snippet from each of his draft profiles, but I highly recommend checking out the full stories, because there's much, much more info than what you'll see below. The Sixers would not have brought Knox in for a second workout if there wasn't a lot of interest in adding him to their current group. He had some of the most impressive flashes of any prospect this season, and with youth on his side you could argue he has some of the highest upside in the draft. If the burner accounts tied to the Colangelo family are to be believed, Miles Bridges will absolutely be in the mix when the NBA Draft takes place this Thursday. Conceptually it's not the worst idea in the world, as he represents a combination of present-day talent and future upside that is hard to sneeze at. A lot of the problems I can foresee with his offensive game could be mitigated by the increased space he'll have in the NBA. His handle is not a total disaster and he has the physical talent to take small windows of separation and turn them into baskets. There is something to be said for having outlier athleticism and the instincts to match. Smith is a relentless player on both ends of the floor, and he has proven capable of using that to great effect already. His activity is not all dunks and highlight reel plays, either, and manifested itself at the college level in areas like screening. Smith was downright giddy to hunt down players to hit with a screen at Tech, helping to create separation and open looks without ever needing the ball in his hands. Smith would need to take an astronomical leap forward to cut the mustard as a primary ballhandler, but that's not likely to matter as much within a Sixers context. The Sixers already have ballhandling prospects they believe in between Ben Simmons and Markelle Fultz, and provided the latter rounds into shape, the Sixers simply need players who can be functional creators for themselves and others in times of need. RELATED: NBA Mock Draft: Could Luka Doncic slide to fourth overall? Despite all the concerns that come attached to Walker, he's a name that a lot of draftniks have connected to the Sixers in recent weeks. Some of his biggest proponents are people who have followed his career since high school, where he became a five-star recruit for obvious reasons. Belief in him didn't just emerge out of nowhere. Your affinity for taking risks will probably inform your opinion on Walker. He has shown enough flashes to warrant some optimism for his development, and assuming you think he has a good head on his shoulders, maybe you believe he'll turn those flashes into consistent, impactful basketball. More than anything else, those underlying traits like work ethic and willingness to learn/improve helps separate the dime-a-dozen, toolsy guard prospects from the guys who put it together and deliver on their promise. The Sixers absolutely have a need for players who can put it on the floor and create, but that can't come at the complete expense of shooting the basketball. It would be a very tough call to look at a player who was hesitant to shoot in college and believe he could remain a knockdown shooter at high volume at the pro level. 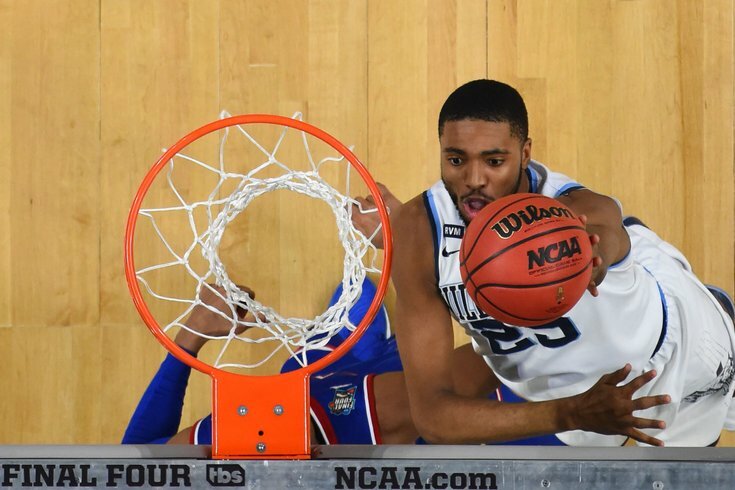 What you see in Mikal Bridges ultimately reflects how you think about several big-picture things: what are the Sixers' most glaring needs, and what should teams be doing with good, but not great draft picks? Were there more evidence to suggest Bridges was on the verge of transforming his handle and thus his NBA prospects, this would hardly be a conversation right now. A capable defender who can shoot the ball and score on a variety of off-ball action would be a boon for the Sixers either way, even if he doesn't hit his 99th percentile outcome. What about trading up for Luka Doncic? Should the Sixers be interested in packing some of their six five picks and moving up, one player who could interest them is Luka Doncic. The 19-year-old Slovenian is likely to go in the first few picks, so would a trade up be worth it for the Sixers? Here's Kyle Neubeck with a little behind the scenes info on what the Sixers think of Doncic — and how the recent changes in the Sixers front office could play a big role in whether or not they make a move. None of this will ultimately matter if the Sixers aren't willing to pay the price it will take to move up into that range. With Simmons and Embiid basically untouchable, the Sixers have a lot of interesting players but not necessarily a lot of trade headliners. Their own picks are no longer premium, and they remain gunshy about giving up too many future assets before their future begins to really crystallize. For more on what Doncic brings to the table, and why he'd fit so well with the Sixers, you should check out Kyle's full breakdown. Here's a look at who will be making each of the 60 picks on Thursday night.